Beautiful riverfront cabin that sleeps seven in beds. Conveniently located in the heart of Grand County, near golf, skiing and the National Forest. Approximately 15 miles north of Winter Park and 15 miles south of Grand Lake on scenic Highway 40. A green-built community, with 1/2 mile of private fishing on the trout-rich Fraser River. Four trout-stocked ponds on premises. Must have Colorado fishing license. FLY FISHING AND CATCH & RELEASE ONLY!! Located on 36 acres with peak views, playground, heated pool (summer months only). Walking, snowshoeing, cross country ski trails. One -of-a-kind 4th of July community parade and fireworks. Ten feet from the Fraser River. One spot near house, overflow area available. Only for DVD/VCR use. No cable service. Crock pot, coffee maker, blender, toaster, mixer. What a great place to stay. This is the third year we have spent a week at this property. 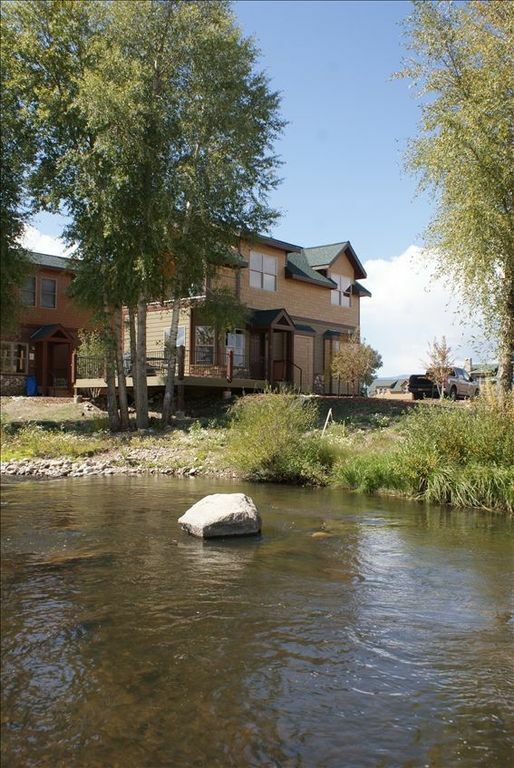 Perfectly located for a week long fishing expedition on the Fraser, Colorado, Williams Fork, and Arapaho Creek. We love the deck overlooking the river, and we used the grill several times. This is a fantastic place right on the river. A little tight on space but well worth it. If you like to hear a river running and have fly fishing within 5 yards of your front porch, then this is the place for you. We had a great weekend winter stay at the Riverfront Cabin! 2 families with 2 kids each fit perfectly. The cabin was stocked with towels and blankets. The kitchen was well stocked too for staying in and cooking. We also enjoyed the hot tub in the community house. Very pretty and peaceful setting. We all want to come back in the summer for fishing and to enjoy the river that is literally right out the door! Thanks for a great presidents weekend! Our party of 5 adults and 3 kids fit this small but comfortable modern cabin perfectly, it was our first time at the Rockies and we had a great time at Granby Ranch (5mins away), Grand Lake shops, fireworks and lights (20mins north), tubing and sledding in Fraser (20mins south). There is a Kroger owned market 5mins from the cabin with everything you may need, the house and kitchen are pretty well equipped, functional and clean. I highly recommend this listing. We really loved this house/cabin! my kids loved it so much. Everything is good! three rooms and three bathrooms were awesome! they have all what we needed! and it was perfectly cleaned and cozy. Beds were very comfortable and spacious. Plenty of room for 3 adults and 4 kids - we loved having 3 bathrooms! The upstairs balcony was the adult retreat. I slept with the sliding glass door open part -way every night so that I could hear the rushing river below. (It was a rushing torrent, probably because of the melting snow - so we had to watch the children with hawk-eyes.) This was the annual grandkids trip. When I asked them where they wanted to go this year for their summer vacation, these East Texas kids told me that they wanted to play in the snow - So this Texas family headed to CO. There was plenty of snow in the upper elevations on the western side (closest to Granby) of RMNP. We played til exhausted or frozen every day, hiked the short trails, shopped in Estes Park (a 2 hour drive), and made s'mores in the outdoor fire area. We had a full moon - it was absolutely beautiful. We were here the 2nd week of June and we were the only family in the development. We made good use of the hot tub at night and did a lot of our cooking in the well equipped kitchen. We were happy to find a great grocery store in town and found two red-box video outlets (at the grocery and the 7-11)! The owners were always responsive to our questions. I would definitely recommend this rental.